The VisionPro M500 system is sophisticated, true 3D technology coupled with an intuitive Windows® 7 or Windows 10 OS. Packaged in a rugged, bench top platform designed for show, engineered for the most advanced measurement requirements found within the stencil printing process. 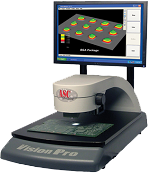 Offering a larger FOV sensor for better coverage and real-time, integrated SPC run charts and data reports, the VisionPro M500 provides exceptional value for the electronics manufacturer concerned with improving production yields.